The US philosopher William James said that, 'The greatest weapon against stress is our ability to choose one thought over another'. This app is a tool to assist those in recovery from abuse, trauma and addictions of any sort, to maintain a healthy choice over their thoughts and choices. 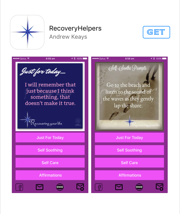 The app consists of four areas - two different sets of affirmations, self-care tips and self-soothing suggestions. It also has links to the live Facebook page and daily news where more resources for support are available. This is a simple tool that offers suggestions for those moments when it feels too hard to think clearly....those times when you need an affirmation to encourage you....a suggestion for something to calm you when you are feeling frazzled....or a tip for something kind you can do for yourself. To download from the iTunes app store click here. Coming soon - the android version.